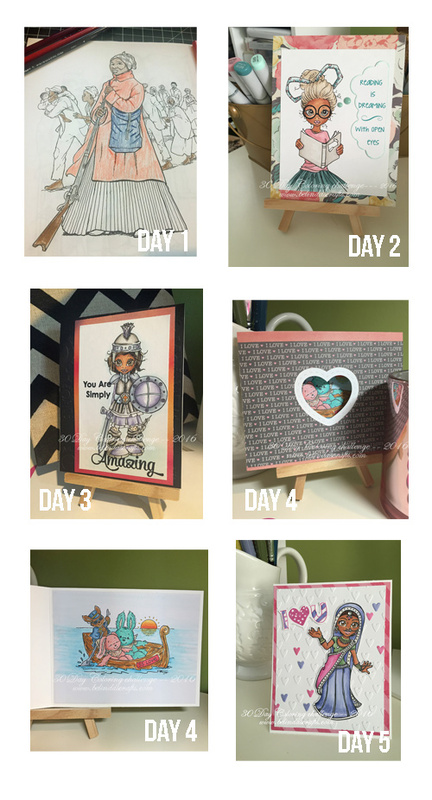 30 Day Coloring Challenge Recap! 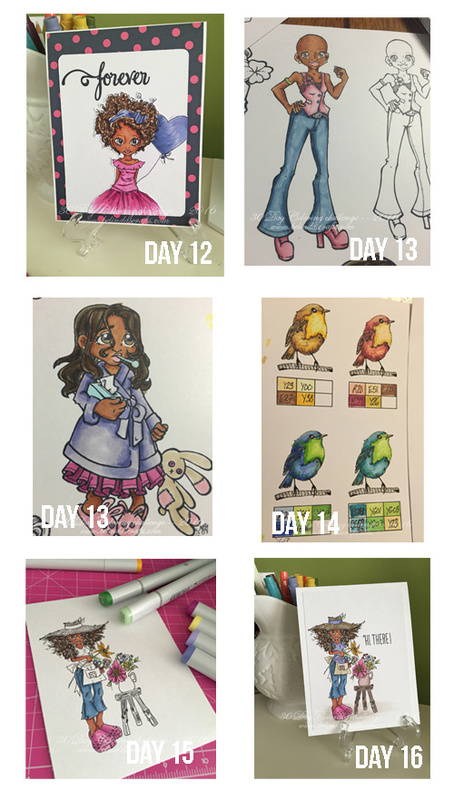 Over the course of 30 days I used color pencils, Copic markers, watercolor crayons, distress inks, watercolor paints to color. I really had fun playing and not feeling any pressure for perfection. 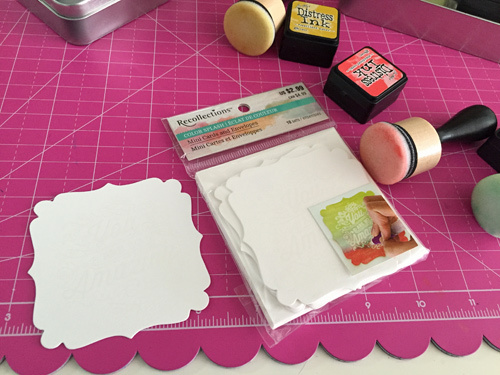 I was happy to break out stamps and products I never used before that have been hanging around my craft room. 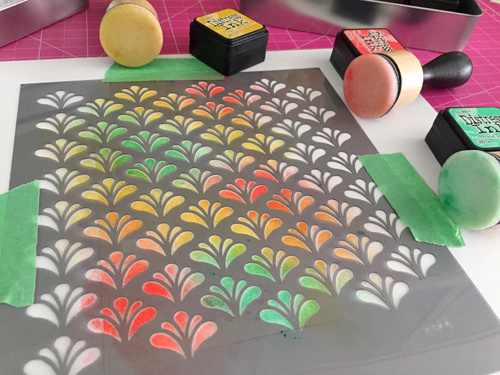 I loved re-acquainting myself with my embossing folders. 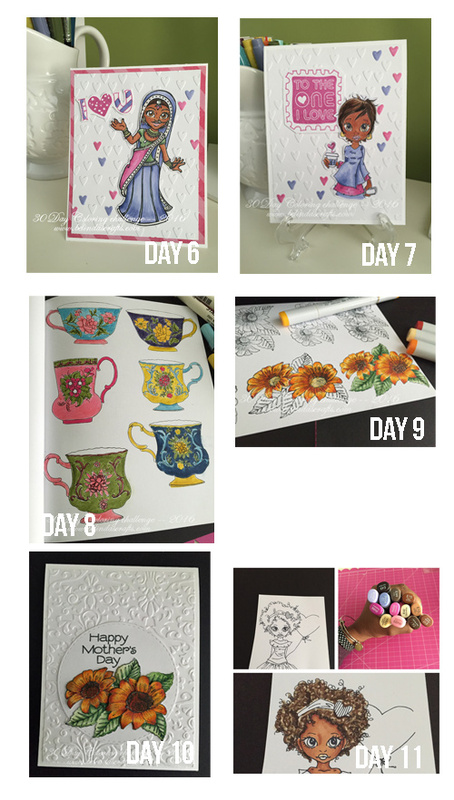 They are such a great tool to have and add so much dimension to the cards. Finally using my coloring books makes me feel less guilty for purchasing them on impulse. I hope you had fun hanging out with me for this challenge. Your sweet comments helped to keep me going so thank you. Now I have all these lovely projects to look at. Hello Everyone! I did it!! 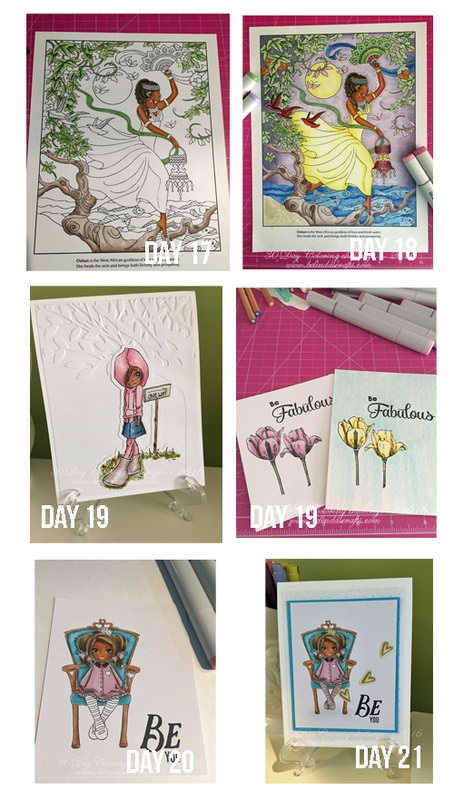 I completed my 30-day Coloring Challenge. It took me a while to get to Day 30 but here we are and I am really happy I tried this challenge again. 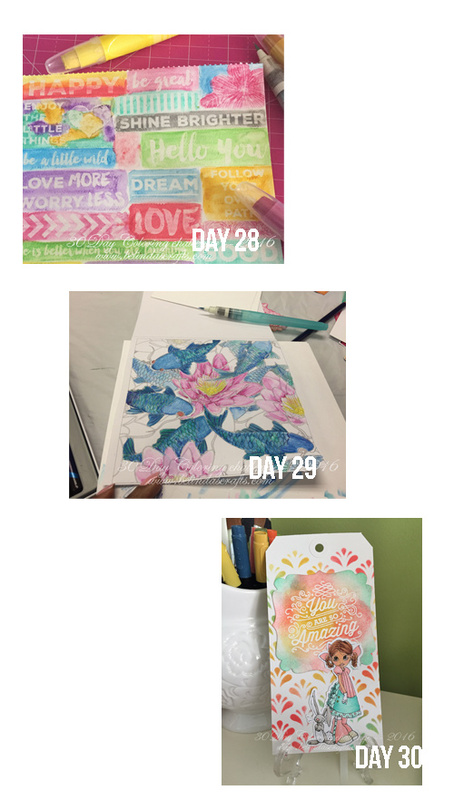 I pulled out my distress inks, cardstock tag, a stencil, a digital stamp and my Copics to create my day 30 project. I have had these tags around for a long time and this seemed like the right time to break one out and use it as a base for the project. 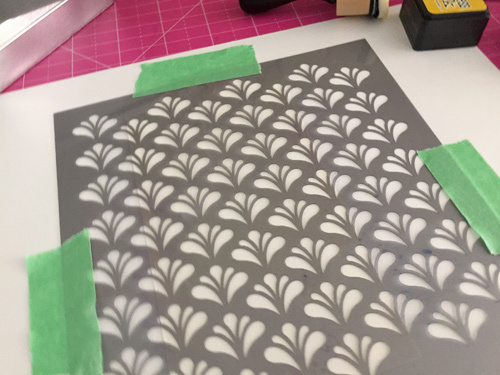 I taped the stencil down so that it wouldn’t move while I put down the distress inks. I selected three colors: Cracked pistachio, fossilized amber, and abandoned coral. I love how these colors blend and compliment each other. They definitely remind me of Easter so I think it was a perfect selection for the digital stamp I selected. When I removed the stencil I just loved the result. Apollo happened to be in the room and said he wanted me to make an additional one he could use for a bookmark. What a pretty bookmark this makes too. I also grabbed this mini card set from my recent Michael’s Haul from the Recollections’ Color splash line. It already had the sentiment on it so all I needed to do was add color. So I used the same three distress inks. 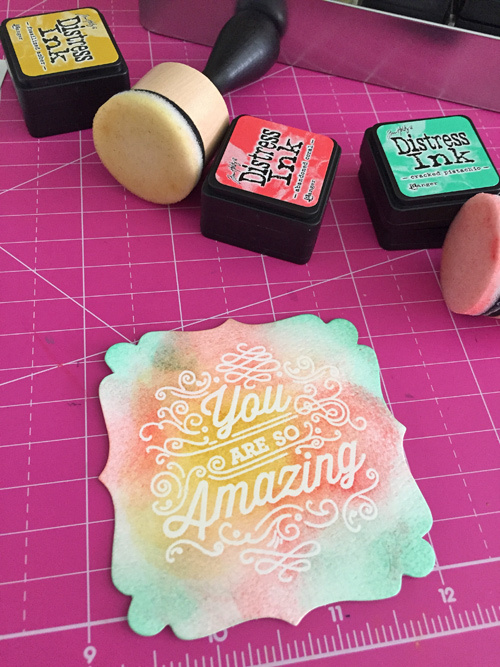 I love that I can use the distress inks on these products too. I picked this Saturated Canary digital stamp to add to the project. I had this already cut out. 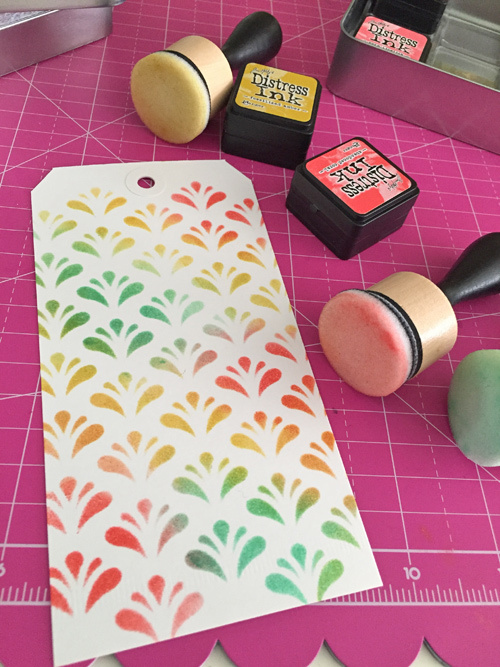 I often cut digital stamps out in varying sizes so that I can use them on different projects so this one was the perfect size for a tag. I used my Hex Chart to find coordinating colors in my Copics stash to use to color her up. The final product came out so cute. 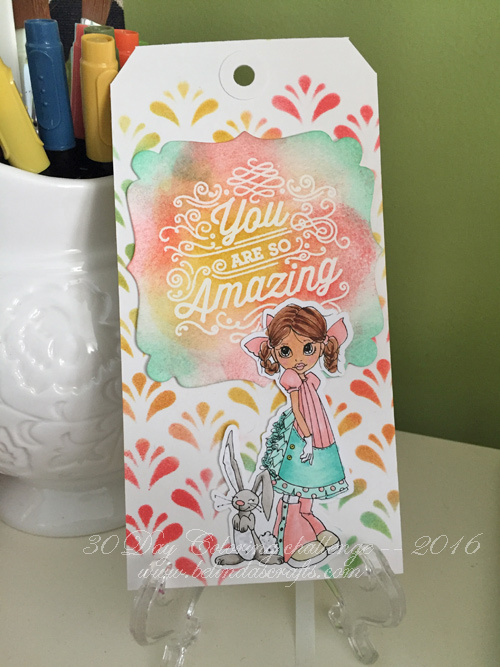 It’s a vary happy tag and makes me think of spring, Easter and joy! 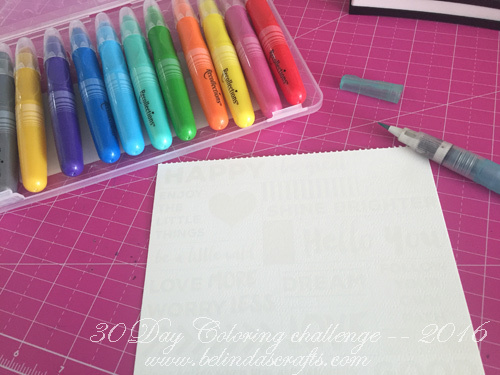 I will be creating one last post with a wrap-up of the 30 days for this coloring challenge. I enjoyed it and love all the fun things I was able to make with my commitment to color for a minimum of 10 minutes each day. Hello and happy Sunday! I am just home from my in-laws and wanted to make sure I posted my day 29 coloring from yesterday. I did not color today so can’t finish up today as planned. Yesterday I spent the day crafting with a bunch of my crafty girlfriends and thought I would continue playing with watercolors. It is always so much fun to spend a day playing with your craft stuff surrounded by friends that are just as crazy about this stuff as you are. I have to say I wasn’t very confident but pushed through the process. I took a page out of one of my coloring books and used my Inktense water color pencils to color it in. I used my waterbrush because it was small. I definitely feel like I need to keep practicing so that I can get the colors to blend better and learn to control the color better. I tried a coloring directly on the paper and then adding water and then I tried rubbing my brush on the pencil and I think that worked better. It allowed for better control and less streaking. I won’t give up. I know I am hard on myself since I am so used to my Copics but I feel that with time I can feel more comfortable with water coloring. Tomorrow I have an appointment to find a dress for my girlfriend’s wedding so no coloring but I would like to finish this challenge by Wednesday. Well I am off to go watch the series finale of Downton Abbey! 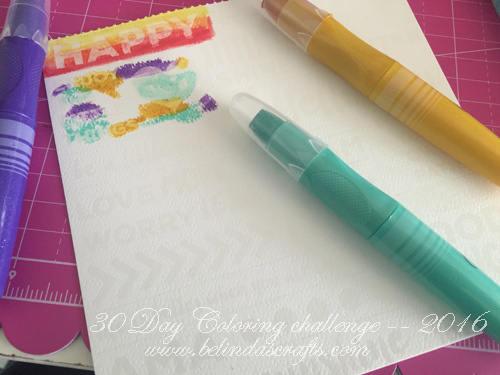 30 Day Coloring Challenge #4: Day 28 I’m Having Some Watercoloring Fun! Hey you! I hope you had a great Friday. I had a great one. I had time to play around with some new products and I had lunch with a friend I haven’t seen in a very long time. It’s so amazing how wonderful I feel after spending time with my friends. 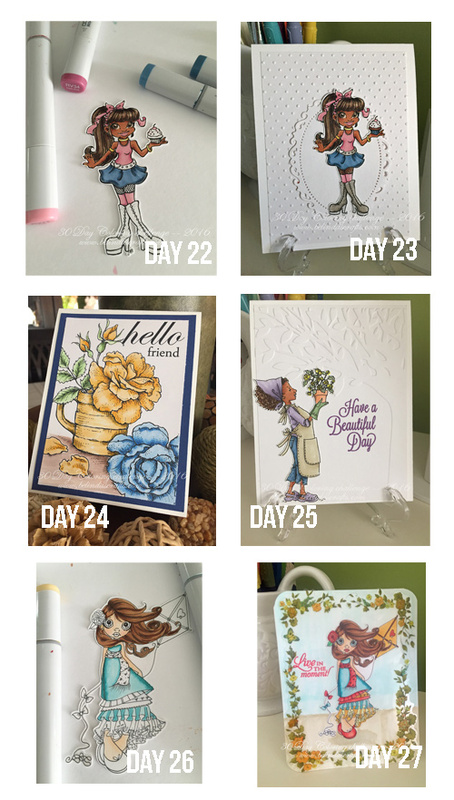 Wow today is day 28! I have two more days to go. Today I played around with some new products so my Copics had a little rest. Yesterday, I had a shopping spree at Michael’s. You can read more about the goodies I bought here. So I wanted to let you know my initial reactions to the new Recollections products that have been released at Michaels. 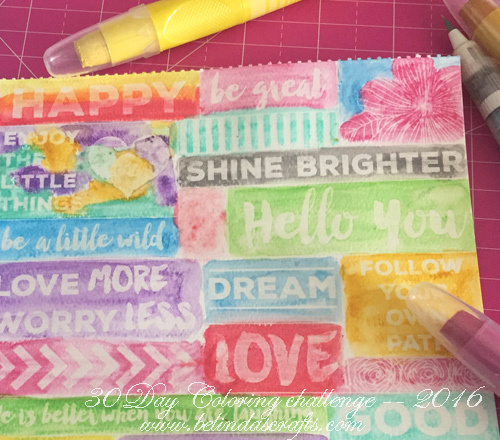 I tried out the ombre stamp pads and I did not like them. I was so excited they were less than half the price of Hero Arts pads. However, the old saying you get what you pay for definitely applied. 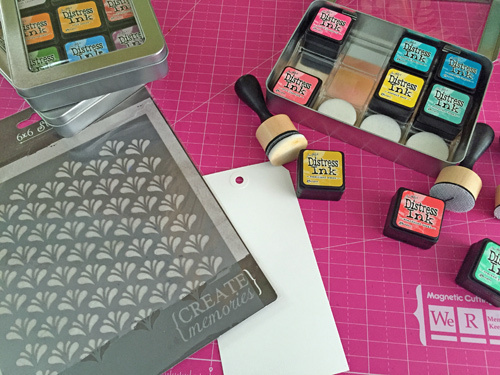 I am a stamp lover so you know I have lots of ink pads and I like quality products. For one, when you open them the three shades that make up the ombre are on 3 different pads. I didn’t much like that. It reminded me of the old style multicolor pads. But more importantly, the impression is what I look at and it had a splotchy appearance. I want more of a crisp look so I didn’t like the effect it produced. So I returned all three today. Next I played with the Color Splash Watercolor Crayons. 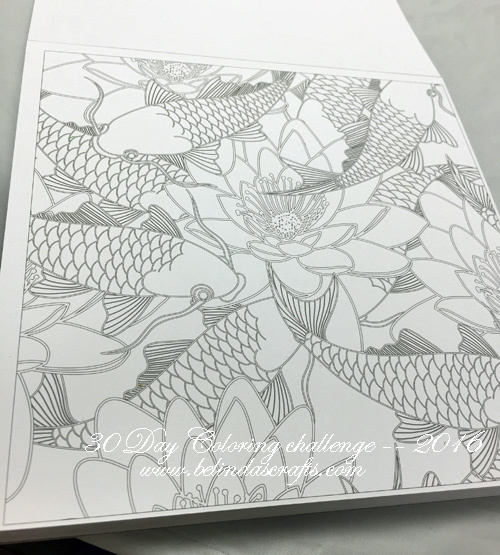 I used one of the sheet from the Color Splash 6×6 pad. I first colored a bit and then used my water brush to activate the watercolor effects. My first impression is that the crayons are thick so fine detail coloring is out of the question. The other is the texture of the crayons were more like a lipstick – creamy. So they are very soft so they don’t require you to press down too hard. If I want the color darker I would have to apply more pressure and then when I added water they would produce a vibrant color. I have to say I love the colors they selected for this set. The aqua, gold, green and pink were my favorite. They have predesigned images on the pages so once you color them the images would resist the paint. 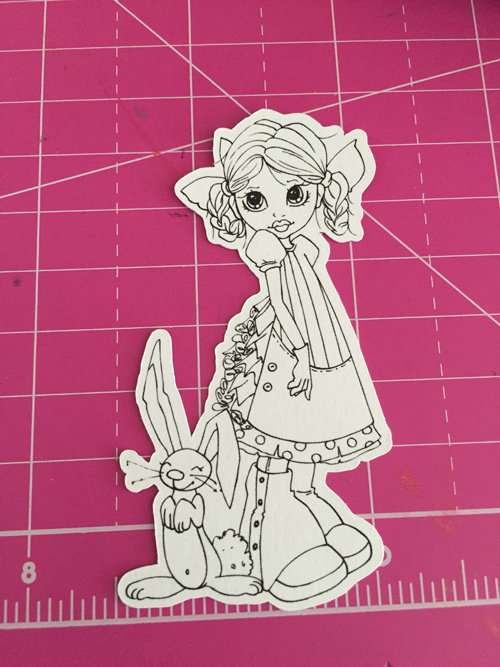 I thought this one would be fun to color and then cut them up to use in my Project life or other journaling projects. Another thing I liked about the crayons is they have a slight shimmer that appears after you apply water and remain after it dries. I did swipe my finger over it and a little residue does come off on your finger but no way near the amount that annoying glitter (my nemesis) does. I like how this page came out and look forward to practicing some more with more pages from the paper pad. One thing I didn’t like about them, is that when you color with them, they sometimes produce build up lumps that don’t blend and when you add water they just move around. Think like when you paint your nails and some lint gets trapped under the paint (annoying!!). But I think, with time I can manage that better. Overall a winner in my book. 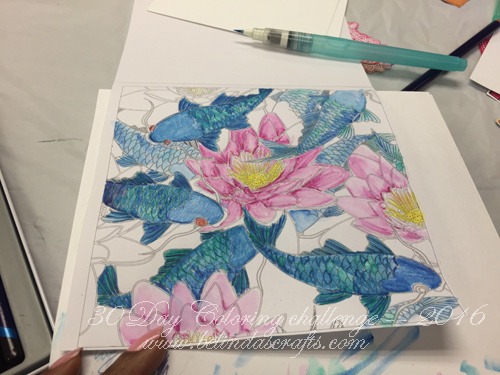 I am going to play around more with them tomorrow and I am also going to try using my other color pencils and water color paints on some of the 6×6 papers. Well I am off to make dinner and have movie night with my family. Have a fabulous weekend!